Suppose you have samples located in environmental space or in species space (See Similarity, Difference and Distance). If you could simultaneously envision all environmental variables or all species, then there would be little need for ordination methods. However, with more than three dimensions, we usually need a little help. What PCA does is that it takes your cloud of data points, and rotates it such that the maximum variability is visible. Another way of saying this is that it identifies your most important gradients. In this example, it is possible (though it might be difficult) to tell that X1 and X2 are related to each other, and it is less clear whether X3 is related to either X1 or X2. Our job is to determine whether there is/are a hidden factor(s) or component(s) (or in the case of community ecology, gradient(s) ) along which our samples vary with respect to species composition. (Note that X2 has negative values, something that will not happen with real species. I am only including such a variable to demonstrate that the initial scaling is not relevant in PCA). A footnote: it may be argued that we should not divide by the standard deviation - we would want a species which varies from, say, 8 to 10000 individuals to be considered more variable than a species which varies from 100 to 102 individuals. By standardizing, we are giving all species the same variation, i.e. a standard deviation of 1. We actually can have it both ways: a PCA without dividing by the standard deviation is an eigenanalysis of the covariance matrix, and a PCA in which you do indeed divide by the standard deviation is an eigenanalysis of the correlation matrix. (to do the latter in CANOCO, you need to specify "center and standardize" your species - recall that the covariance of standardized variables equals the correlation!). When using species/variables measured in different units, you must use a correlation matrix. 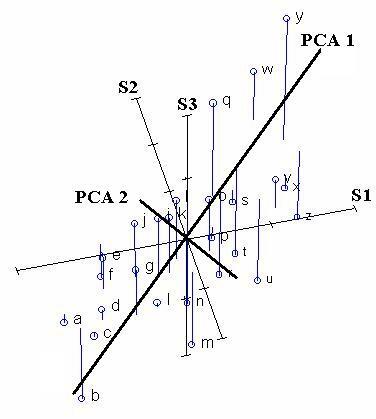 Principal Components Analysis chooses the first PCA axis as that line that goes through the centroid, but also minimizes the square of the distance of each point to that line. Thus, in some sense, the line is as close to all of the data as possible. 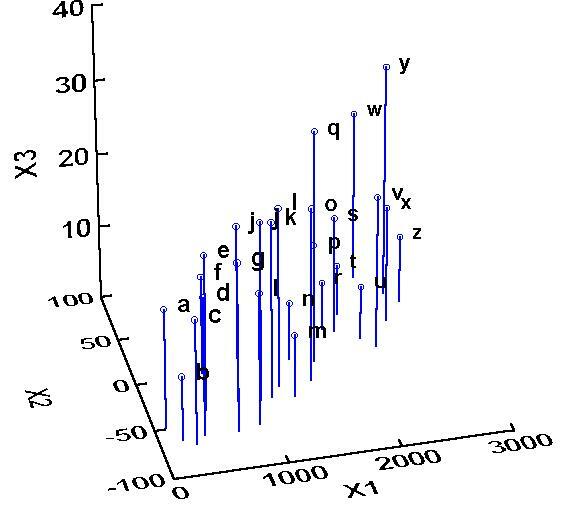 Equivalently, the line goes through the maximum variation in the data. The second PCA axis also must go through the centroid, and also goes through the maximum variation in the data, but with a certain constraint: It must be completely uncorrelated (i.e. at right angles, or "orthogonal") to PCA axis 1. We can see that samples a, b, c, and d are at one extreme of species composition, and samples t, w, x, y, and z are at the other extreme. But there is a secondary gradient of species composition, from samples b, m, n, u, r and t up to samples l, q, w, and y. What is the underlying biology behind such a gradient? PCA, and any other indirect gradient analysis, is silent with respect to this question. This is where the biological interpretation comes in. The scientist needs to ask, what is special about the samples on the right which make them fundamentally different from those samples on the left? What is it about the biology of species 1 that makes it occur in the same locations as species 2? If we were going to plot three axes, then why even bother to perform PCA in the first place? We end up with just as complicated a diagram as we start out with (i.e. 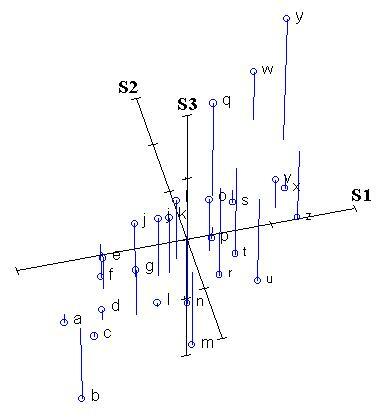 samples in 3-dimensional species space. The third axis is much, much less important than the first two, as described below. In other words, our first axis explained or "extracted" almost 2/3 of the variation in the entire data set, and the second axis explained almost all of the remaining variation. Axis 3 only explained a trivial amount, and might not be worth interpreting. 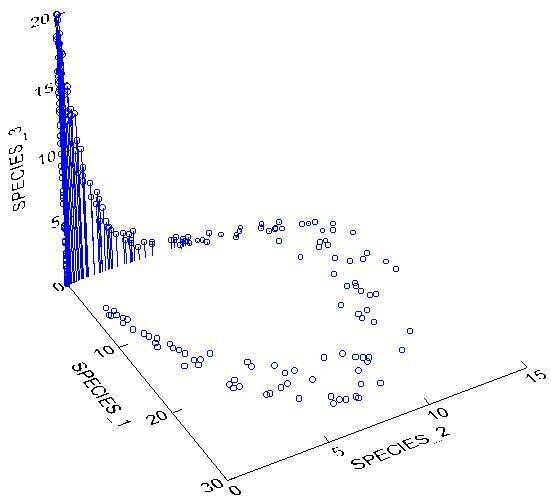 This means that the value of a sample along the first axis of PCA is 0.9688 times the standardized abundance of species 1 PLUS 0.9701 times the standardized abundance of species 2 PLUS -0.1045 times the standardized abundance of species 3. We can interpret Axis 1 as being highly positively related to the abundances of species 1 and 2, and weekly negatively related to the abundance of species 3. Axis 2, on the other hand, is positively related to (and therefore correlated with) the abundance of all species, but mostly species 3. 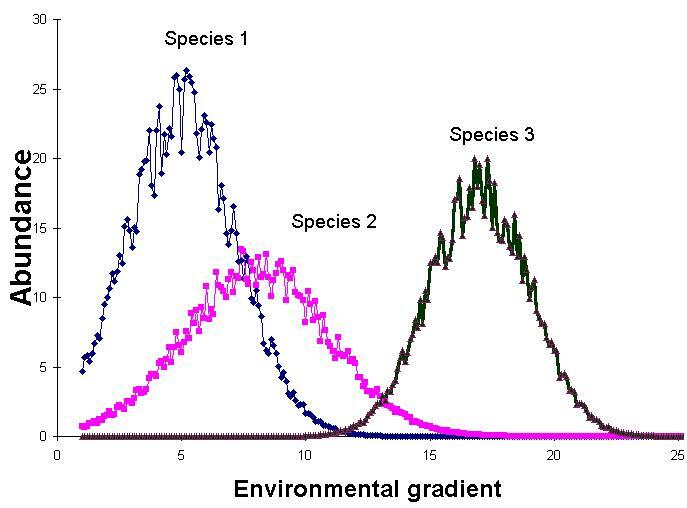 So the "gradient" reflected by Axis 2 is something which benefits species 3. However you describe the above cloud of points, it is certainly not a simple line or a plane. PCA would fail miserably with such a data set. In particular, PCA produces an artifact known as the Horseshoe Effect (similar to the Arch Effect), in which the second axis is curved and twisted relative to the first, and does not represent a true secondary gradient. Do note, however, that if we only sampled a small enough section of the gradient the data might be linear enough to allow the use of PCA. This illustrates the horseshoe effect. The second axis is a curved distortion of the first axis. The second axis also has no easily understood biological meaning: there is no obvious reasons why samples 6, 7, and 8 should be at opposite ends of a gradient from samples 1, 2, and 9 through 12. However, do recall that there was one predominant gradient: that of sample 1 through 12 (being a wetland to dryland gradient). However, PCA distorts this relationship with some incurving. 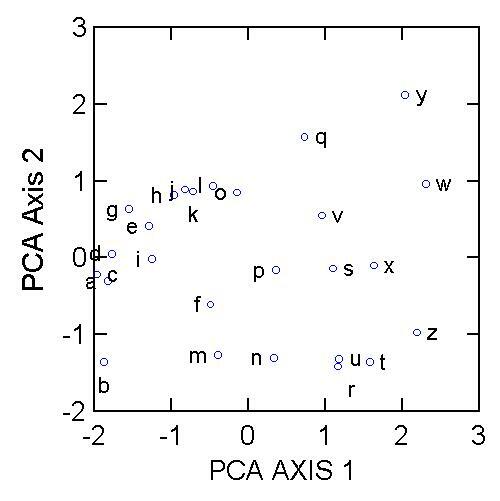 Instead of going from sample 1 to 12 (as it should), the most extreme samples along PCA Axis 1 are samples 3 and 10. The "toe" of the horseshoe can either be up or down; in this case it just happens to be down. In this particular example, we are able to see the arch, and therefore might be able to conclude that the "real" extremes are quadrats 1 and 10,11, or 12. This is because there is only one clear gradient and the gradient is so strong. However, in many data sets, there may be more and weaker gradients, as well as more noise. Therefore, it would be very difficult to make sense of PCA. 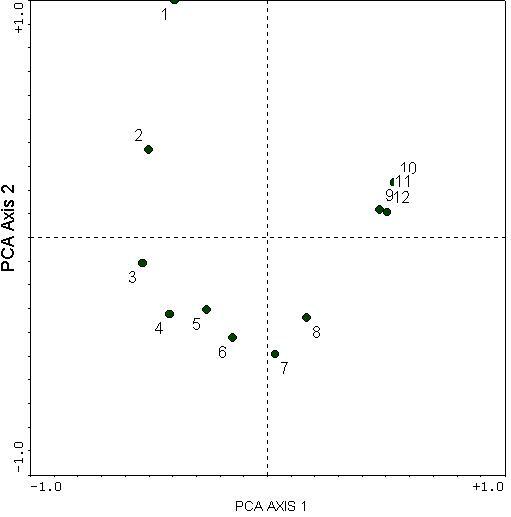 Although PCA is seldom useful for the analysis of samples in species space, it is still quite appropriate for the analysis of samples in environmental space. This is because it is likely for most environmental variables to be monotonically related to underlying factors, and to each other. Also, PCA allows the use of variables which are not measured in the same units (e.g. elevation, concentration of nutrients, temperature, pH, etc. ).